Amonkhet is the latest set for Magic: the Gathering, and the first set in Amonkhet block. Amonkhet is an Egyptian themed desert plane, and also the current abode of Elder Dragon Planeswalker Nicol Bolas. Amonkhet continues the trend of “Masterpieces”, this time known as Invocations. This extremely rare sub-set of 26 cards contains a number of Legacy and Commander staples, as well as knew cards from Amonkhet. 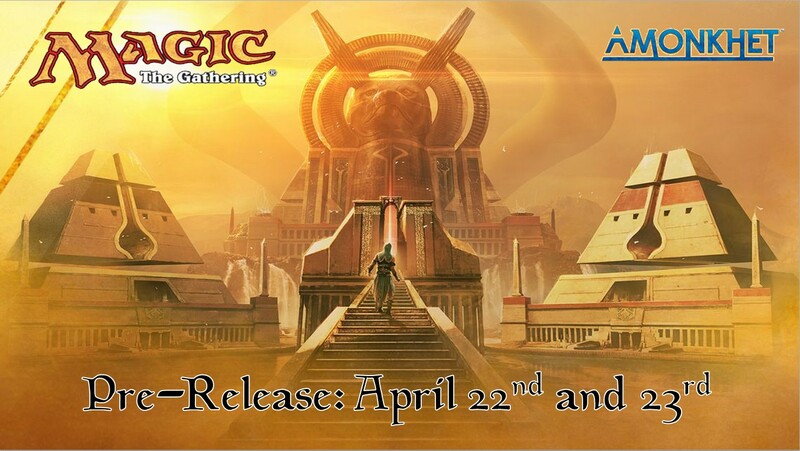 This is a sealed deck event where each player will receive a special kit containing six Amonkhet packs, a promo card, and a spindown life counter. Continuing in this set, ANY rare or mythic rare can appear as a date-stamped promo card! Each player builds a 40 card minimum deck from the cards in their kit and basic lands (bring your own or use ours). Each box will also contain a “Trials” card. Hang on to your trials card and complete the trials over the next month to earn special foiled land cards!